We were up at 6, ready to take our bike the six miles to the airport. We had to be there by 10, but couldn’t make out the route from the map, it appeared to want to take us on the runway! After breakfast, and a quick stress explosion whilst making sure everything flammable and liquid had been removed from the bike’s storage, and packing everything as neatly as possible, we were off. There was a diversion on the highway (of course- we already knew this was one of the busiest roads ever from Thursday's jaunt to the hotel), and we were soon down on the back streets, bumping up and down in the potholes again. A roundabout appeared through the belching fumes of the traffic, and after a quick recce, we decided our route and took the left turn. This turned out to be completely correct and the cargo terminal appeared after 1 kilometre on the right. Entering the cargo area we passed the Customs office on our left, but were keen to check the bike in with Air Cargo Pack, the air cargo company so sailed past. The offices and warehouse of the shippers were the usual busy hub of any freight terminal, and i waited whilst Paul went to find Leivy, the lady who had been so helpful by email yesterday. He soon returned stating that we needed to head back to Customs right now. By this time I had packed our jackets, trousers and helmets into the sidecar, so my only option was to walk back again. In the dripping heat, that turned out to be easier said than done, but no matter I was soon there. Paul was already at the window of Customs, with three ladies giggling at him and asking if they could come with them to Colombia! We had a laugh together, and the super lovely lady at the window carried on going through our bike paperwork, whilst we enjoyed the shade outside her office. The customs or migration people are always behind a window with glass, but this one seemed a bit awkward as the opening to speak through was so low, Paul had to crouch down to speak. Very odd! Perhaps that’s why a lot of the drivers were just opening the door to the offices and putting their heads through for attention. I guess a lot of the drivers are there most days collecting cargo for local delivery, or forwarding. We both entered apologetic, humble mode, using smiles and soft words, whilst kind lady started to make some phone calls. We weren’t quite sure what she was doing, but it seemed to be in our favour? After a few minutes, she told us to wait and started seeing to the queue that had begun to form behind us. This entailed seeing to their paperwork, taing some money and inspecting their vehicles. After 10 minutes, the door of the office was opened and a chair was pushed through for me to sit on - we took this as a very good sign. 5 minutes later, we were asked if we wanted to buy a drink from them for $1 US. We did, and looked at each other again, with hope. Eventually, after about an hour of waiting, nice lady took our passports, and returned with them stamped with the vehicle exit. She explained that she had managed to call the border where we had come in and have them alter the exit point on the vehicle permit (she did not have authority to make this change for us). We were very thankful to her, and felt so relieved, and then she apologised for keeping us waiting! A great experience, with lovely, friendly people. I started my hot plod back, and Paul rode the couple of minutes it took him back to the cargo area. 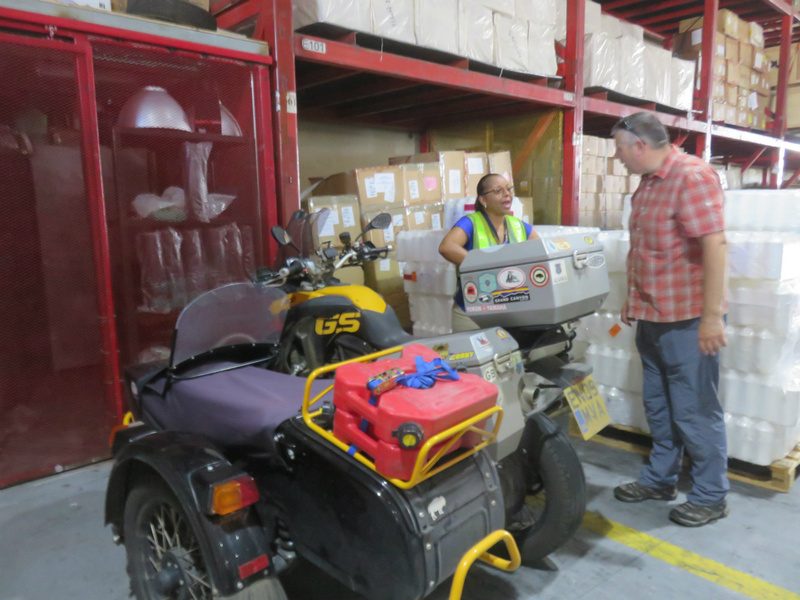 There, everything went quickly and smoothly as we pushed the bike into the warehouse and were taken into the office, for payment, paperwork and some very friendly chat from Leivy and her boss. The boss told us that he has arranged shipment of 1,000 motorbikes over 10 years, and average of 2 per week, either to or from Colombia. He asked us to recommend his wonderful service to our friends, and we told him without a doubt that we would. He also stated that we could call him with any problems, of any kind whilst travelling South America. They called a taxi for us, and we were back to the hotel by 10.45 am, a little early for a Pina Colada perhaps. We can now relax and make sure that we are ready for our flight at 11.35 am tomorrow. The bike leaves slightly earlier than us at 11am. We shall be able to collect the bike on Monday from 8am onwards, from the warehouse and offices of the same company, in Bogota. For those of you wondering why we are not riding to Colombia, the roads stop in Panama before the Darien Gap, which is 60 miles of jungle and no thoroughfare. It's a notoriously dangerous area, where drug lords live in dens (could be stuff of legend only?) and would require me going ahead of the bike with a machete, cutting our way through! So, the choices are to take a sea passage or air freight at a similar price. We chose air for ease and speed. A lot to catch up on today. This week has been mainly rain, and lots of it mingled with upset tums. Both of those things held us up for a couple of days, and so we only arrived in Panama City yesterday. The rain was of astronomical proportions, and continued like that on Tuesday and Wednesday, although when we set off on Thursday from Santiago, we thought the weather looked ok. It was, apart from a ten minute stretch in the middle of the ride, which once again ended up with me being soaked through to the skin despite the goretex suit. The rain comes from every angle and fills up the sidecar like a bucket, so I’m effectively sitting in a puddle! Still, it’s never happened before, so maybe it’s just a Panama thing? We took the ride with a little trepidation, we were watching out for Customs and Migration people, more than normal actually. This is because on Monday we seemed to narrowly avoid a bit of trouble when we were stopped at a Customs checkpoint in the mountains. On inspection of our vehicle paperwork it turned out that when the annoying man at the Nicaraguan border had completed our vehicle permit, he had noted Paul as owning the vehicle, and me as the driver! Now, although I have a bike licence I have never ridden Paul’s bike, with or without a sidecar attached. However, when asked if I was the driver, Paul answered that we both were, we took turns. What came next was a comedy of errors, because the Customs guy said that because it named me and not Paul on the paperwork, then I had to be driving. My heart started racing, as I turned to Paul in horror, to hear him saying ‘ok, no problem, we’ll change over there’ pointing to a pull in by the side of the control area. Paul gamely climbed into the sidecar telling me ‘I’m no happier than you are’, and I climbed onto the bike, with Paul giving me instructions, and Customs guy shouting out ‘thank you’ in the background. I stalled once, then twice before managing a lurch to the right heading straight for a steep bank (in my defence it’s extremely different riding a bike with a sidecar), before there was whistling and shouting from Senor Customs. Paul leapt out, and walked towards him, and I stood with my head hanging low in shame. There followed a discussion about how I clearly wasn’t the driver, and he was following the law of Panama, only doing his job. Paul ate humble pie, explaining the document was done incorrectly, and he was sorry he didn’t know why he’d lied, but we were scared. Luckily Senor C was a compassionate man, and allowed us to go on our way with Paul driving, and a handshake each. I think he saw that he’d saved us all from disaster! He did, however, warn us of a control checkpoint with Migration and Customs checks together on the Pan American highway. This left us quite worried, but we paddled our way through. The checkpoint was actually about 35 miles before we swam into our stop on Monday, and someone must have been looking after us, we slowed down for the inspection, but due to the torrential rain, we think the officer just didn’t fancy getting wet, and waved us straight through. Thank goodness! The next couple of days were rest and recuperation, and as we left on Thursday morning, we were lucky enough to meet a Canadian biker called Gord. What a smashing fella, he’d left us a note on the bike, and we met up over breakfast to swap stories. Gord is also riding to Ushuaia, although his passage to Colombia is by way of a sailboat on 13th December. 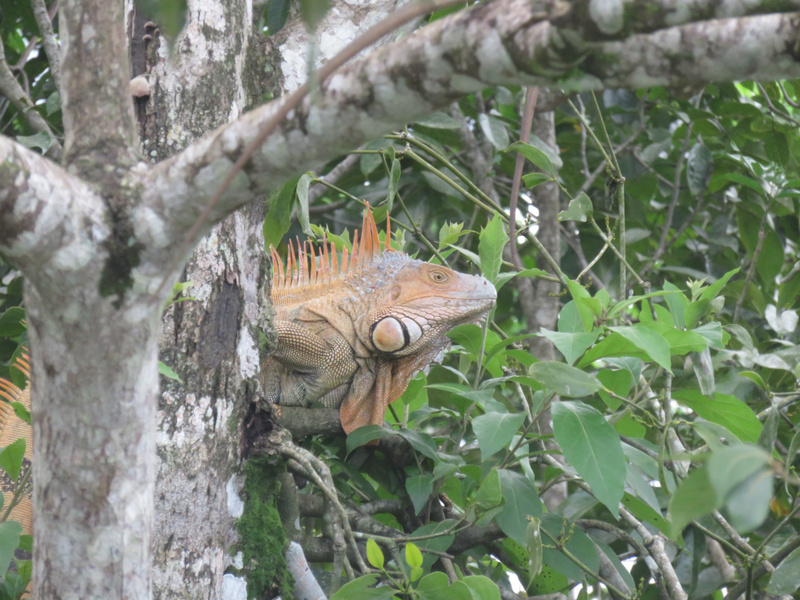 The passage takes a couple of days, with visits to some Panamanian Islands and overnight stops there on the way. This would be a lovely way to travel to Colombia, but we have not chosen this way because of the size of the bike and sidecar and the need to remove the sidecar. Sending our bike over by plane we are not required to make any of those preparations. Anyway, we hope to meet up with Gord somewhere further down the line. Just before reaching Panama CIty on a quick rest stop, we met a guy from Cadiz in Spain, who had ridden from Spain to India, in India he shipped his bike to Vancouver and has ridden from there. Alberto has been on the road for 7 months and ridden 36,000 miles, a bit less than double our mileage. We rode with Alberto in search of the Panama Canal Visitor centre, although Alberto decided to ride on and find his hotel as he was completely soaked through (I was still quite cool on my bottom half). We entered the Visitor Centre and spent an enjoyable hour and a half watching the big ships enter and be navigated through the very tiny Miraflores Locks. On the old Panama Canal (the one we were viewing) there are three sets of locks to navigate on the 80 km length of water which allows boats to pass through Panama from the Pacific Ocean to Atlantic Ocean or vice versa. This canal allows ships to avoid circumnavigating the whole of South America, and is of great importance to both Panama and the world. 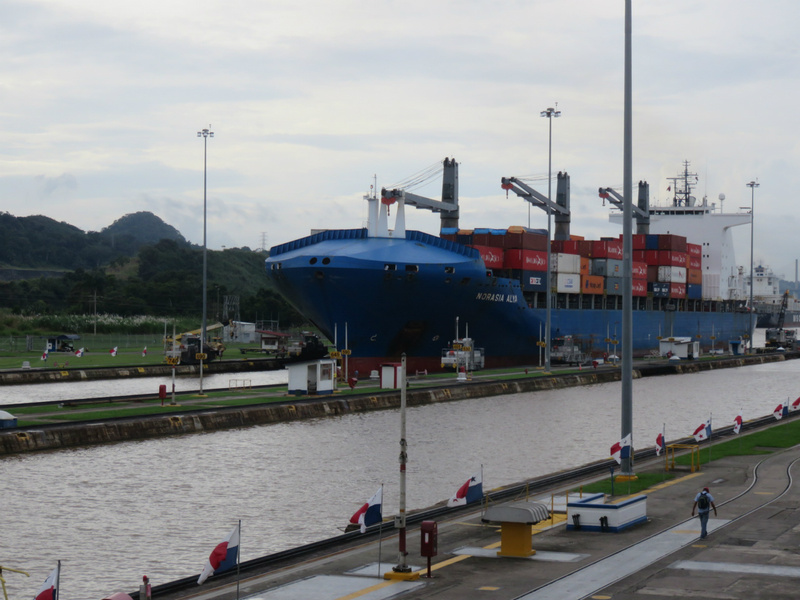 The canal is totally in the control of the Panamanian Government, since 1999 and provides a source of revenue that benefits the entire country. Panama City is very modern, and has an American culture. This is most likely because the Panama Canal was governed by the USA until 1999 and the influence was huge. We set off for our hotel by the airport from the Visitors Centre at 4.45 pm. We had underestimated and perhaps forgotten the horror of being in a busy city. It took 2.5 long, hot, dusty hours to navigate our way through the 18 mile journey. Other countries traffic behaviour can quite often seem a mystery to us, but this was something else indeed. We arrived hot, and exhausted to the hotel, and very pleased to make our way for something to eat and a good nights rest. It was Paul’s birthday yesterday, and as a special treat we made another border crossing! We left the sanctuary of bird and wildlife, waving cheerio to the many dogs and monkeys before setting off the 40 km to the border. As we got nearer, the faces of the people began to change and grew much more Caribbean looking, with darker skin and much bigger hair! There were also many more banana plantations, with workers houses within the perimeters. As we headed into the inevitable no-man’s land that circles any border, the people just seem to be drifting, hanging about for what, I’m never really sure. Perhaps just in case you need something, and they might be able to help you, or sell you a drink for a small amount of change. We had read that this was a small border, and it was, not busy, especially on a Sunday. There were a couple of extra things we were required to do at this border, pay exit taxes for leaving Costa Rica, and Municipality Taxes to enter Panama. Paul does as much of the running about to the various offices as possible (why can they not all be together? ), whilst I guard the bike, this time we disappointed a young boy of about 10 as he was hoping we would pay him to watch over it for us. This time my umbrella system was utilised to make much needed shade, it was sunny and so very humid again. It runs at around 95-100% humidity most of the places we have visited in the last few days, and in goretex trousers, it can be very uncomfortable sometimes. All went extremely well, in fact I began to think, that’s it, it must be record time, when Paul turned and said, the Customs Office power is off………. So there we stood, and waited and waited for another hour, whilst the very important little man from Customs flounced in and out of his office, saying ‘Wait’, ‘un momento’, etc etc. Eventually, he was ready, and once again the crossing had taken two hours, but hey, we were on our way. After some confusing directions leaving the town, with my maps phone app trying to take us up a front path or something, we were off. We rose higher and higher, on some really twisty roads, with views across the Caribbean ocean and Boca del Toro in Panama. It all seemed a fairly remote place, again populated by so many banana plantations, where we were humbled to see the workers living in houses that were very run down, some even looking as though they were made from pallets. The injustice of life that we have encountered on some of our travels is a very difficult thing to digest at times. Paul had had some difficulties finding places to stay when researching, but we had decided on one called Fortuna cabins. Well, it looked nice in the pictures………. Higher and higher still we went, until we were in the clouds. I could see the place marked on my map, but I was thinking, ‘hmm, there’s not much around here’, then on an extremely sharp bend, we caught sight of the sign……..
……… and then it was that we entered the twilight zone! We arrived, and were shown down an extremely steep grassy bank to the ‘cabin’. I was taken inside to our room, and the guy grandly pointed out ‘towels, hot water’, which should perhaps have warned me. Outside we paid the fee for the night, which did seem quite expensive, but hey, we had chosen it, and what else was there? The guy then asked ‘what time would you like lights?’ We looked at each other inquiringly, but I told him, ‘erm, half past four’?. Perhaps this would have been ok, if we had known the correct time, but it appears that the clocks have changed for us again. We settled in, realising that as the described restaurant was probably the manky looking kitchen with bottled gas, and after a quick shower, accompanied by the flame throwing entertainment of the pilot light for the bathroom boiler, we used the JetBoil to cook some rice and tuna. The space of the building was great, there were sofas, and a huge viewing window, with hammocks attached, it was just a shame that the view for us was only cloud. At 5.40 pm, with no ceremony, the lights were suddenly ablaze, and we carried on with our evening, watching some tv on the laptop. At 9.40 pm, with no ceremony, apart from the sputtering cessation of the generator up the garden, we were plunged into utter darkness! We spent the rest of the evening using phone torches, and head torches (thank goodness for them), trying to light extremely damp tealights, and gather all our things together in the darkness. In this utter blackout when it was time for sleep, I was extremely pleased that our little headtorches give out a tiny green glow all the time, so I could at least see that. We locked ourselves into our room, trying not to think about the unlocked front door and seven other empty bedrooms…… What a special birthday treat. This morning, we awoke to the sounds of breakfast being made, the cheerful guy was back, cooking breakfast up for us, eggs, mystery meat sausages and deep fried plantains, with a side of as many bananas as you could eat. We ate this while enjoying the full view of hills, valley and lakes laid out below us, and with hummingbirds buzzing around at the many bird feeders. We were away by 8.30 am, hitting the road, and riding 5 hours in torrential rain like we’ve never seen before. 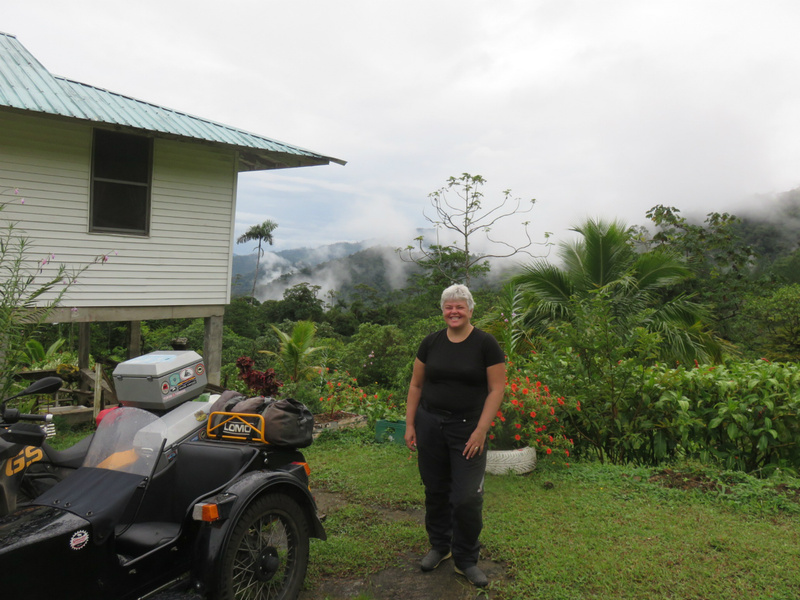 We rode along the Pan American highway with the water sloshing over us, and arrived at a hotel riding through rivers of orange mud to reception. Of course, within an hour of arriving the rain had stopped, but as we sat watching the kingfisher, hero, turtles and swifts on the lake we are one, we soon forgot about the rain. Oh, and the red fuel cans fell off the side of the bike today, due to a snapped bolt. Luckily Paul heard them as we weren't going very fast, so he leapt off and went back for them. We were able to use straps and strap them above the top box of the bike. Just another small issue to be dealt with in some way. What a pleasant surprise Costa Rica has been. Today we have crossed over to the Caribbean coast, the roads have all been in extremely good condition, and the rivers follow the rules of the road! A real surprise, and very good, apart from the fact that this means we need to overtake slow moving traffic a lot more than normal. So I’ve been playing my partin checking to see if the coast is clear for manoeuvres today, being that I’m sitting on the traffic side in my sidecar, and that Paul just can’t see much from his position on the right. It all went well though, we have a code worked out, a tap on the leg for no passing, nothing for ‘it’s clear’ and a real hammering for ‘there’s something coming right now, pull back in!’. The roads seemed surprisingly busy for a Saturday, but I’m guessing that everyone was back out on the roads after the Hurricane threat had passed. As we rode through the fields upon fields of banana trees, I saw many familiar names on fruit factories, such as Del Monte, and Chiquita. The bananas are kept inside plastic bags on their stalks on the tree, then picked whilst green and packed into a container, where they head for the port of Limon, and are shipped in refrigerated containers all around the world. We arrived early to our Lodge, Casa Azul Lodge, which is set in the Caihuta National Park, a haven for wildlife. I am sitting here writing this afternoon with the background noise of angry monkeys. They are sitting in a rose-apple tree, picking off the fruits, opening them and throwing down everything bar the seed in the centre. As we arrived the receptionist ad to warn me to be careful under the trees lining the route to reception. We took a walk through the jungle trail accompanied by one of the seven dog that live here. There are four dobermans (two are puppies, two very loud guard dogs! ), and 3 allsorts dogs. I managed to get a few bird pictures today. It was also very exciting seeing the toucans. When we set off on Wednesday, we knew that Hurricane Otto was on it’s way to make landfall around 7 am on Thursday morning. 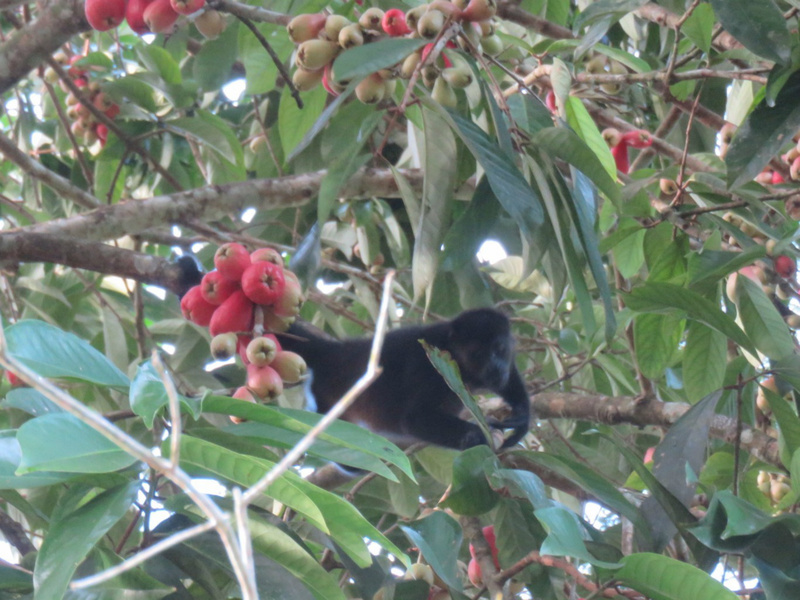 We had looked carefully at the projected route, and had decided on a two night stop near Quesada, 60 miles south of the Nicaragua/Costa Rica border. The border crossing at Las Tablillas we chose was a small one, but even so, in the hour and a half ride to the border in the morning, we were stopped by three lots of traffic police, who wanted to check our documentation (or have a look around the bike? Never quite sure). The first group of police took the longest, as they took all our documents into their hut for checking. Out of the corner of my eye I could see them turning the docs up this way and that, trying to make head or tail of them. Still, something must have made sense as they returned them to us, and we were on our way again. However,my good humour was disappearing by the third stop, just before the border, as it had rained pretty much all the way on the ride, and it was becoming tedious taking the papers in and out constantly. It was extremely quiet at the border, and we were dealt with quickly on the Nicaraguan side, although a little morosely. It’s not much fun for anyone standing out in the rain, whether you’re working, or standing patiently waiting to be checked in. An extremely tall guy rushed up beside me telling me to follow him through immigration, as he had just seen to all the German tourists passports. In actual fact, I think he may have hindered me, as he kept shouting out things in English, as I was being seen by the officer, making the process very complicated. Still, after Paul had gone in and paid our $12 each, we had our exit stamps, and Paul had his for bikey. Then over the border into Costa Rica. This was a whole lot more drawn out. On the surface it looked much nicer, with well laid out storage containers as offices, and somewhere proper for us to park. I waited with the bike as Paul went off to be stamped in. Then the rains really came down! I set up an umbrella system, to keep me and my seat in the sidecar, plus gloves and helmets as dry as possible, and waited, and waited and waited…….. The man who was to produce the import documentation for the bike decided to go for his lunch for 20 minutes when it was Paul’s turn. This 20 turned into 40, and then Paul described him as being a surly, arrogant, ‘devil’, who kept Paul waiting as long as possible just for fun. So two hours later, we were finally done with the Costa Rican border. Yee Hah! We rode the rest of the way to Platanar in torrential rain. The rain and strong wind was a side effect of Hurricane Otto, so we were very happy to arrive at Cabinas Hacienda. On arrival, we were welcomed by Pancho, the manager, who was very informative about the impending Hurricane. There has never been a Hurricane in Costa Rica before, but there government had good plans in place, telling people not to make unnecessary journeys of any kind. They had emergency services on standby. To get candles ready in case of loss of electricity, and they had evacuated 4,000 people along the Caribbean coastline, where the hurricane was meant to hit first. This was about 120 miles to the East of us. By Thursday morning the forecast had changed, and the Hurricane was heading for us, and going to miss the Costa Rican coast. We waited out the storm all day, all the other guests and workers seemed very nervous, and it really did rain relentlessly all day, although the promised winds and Hurricane never came to us. Landfall was made at 7 am, about 70 miles North East of us, and the Hurricane, strength 2, carried on through before arriving at Lake Nicaragua about 2pm, and wreaked havoc, causing floods, trees down, washing out people’s homes and leaving them with nothing. When we rode by San Carlos, at Lake Nicaragua on Wednesday, they did not look like they had much anyway, and it’s heartbreaking to think that the little they have had may have now been taken away. It’s been devastating. In contrast, as we have stayed here for one more day, there has been an air of relief and jubilation here. The Hurricane has made it to the pacific coast where it has downgraded to a Tropical Storm, and should dissipate altogether by Monday or Tuesday. Hurricane season officially ends on 30th November, so l hope the people here will be safe again until next year. This most beautiful part of the world, where we’ve been lucky enough to see exotic birds, geckos and iguanas today seems like it can also be a difficult place to live at times. The people here have a wonderful spirit, that it seems is very difficult to suppress. Good for them!